A source of waves moving to the left. The frequency is higher on the left, and lower on the right. The Doppler effect, named after Christian Doppler, is the apparent change in frequency and wavelength of a wave that is perceived by an observer moving relative to the source of the waves. For waves, such as sound waves, that propagate in a wave medium, the velocity of the observer and the source are reckoned relative to the medium in which the waves are transmitted. The total Doppler effect may therefore result from either motion of the source or motion of the observer. Each of these effects is analyzed separately. For waves which do not require a medium, such as light or gravity in special relativity only the relative difference in velocity between the observer and the source needs to be considered. A schematic representation of the Doppler effect. Doppler first proposed the Doppler Effect 1842 in his paper, "On the Coloured Light of Double Stars and Certain Other Stars of the Heavens." The hypothesis was tested for sound waves by the Dutch scientist Christoph Hendrik Diederik Buys Ballot in 1845. He confirmed that the sound's pitch was higher as the sound source approached him, and lower as the sound source receded from him. Hippolyte Fizeau discovered independently the same phenomenon on electromagnetic waves in 1848 (in France, the effect is sometimes called "effet Doppler-Fizeau"). For sign convention on velocity: A positive value is used if the motion is towards the other, and a negative value if the motion is away from the other. It is important to realize that the frequency of the sounds that the source emits does not actually change. To understand what happens, consider the following analogy. Someone throws one ball every second in a man's direction. Assume that balls travel with constant velocity. If the thrower is stationary, the man will receive one ball every second. However, if the thrower is moving towards the man, he will receive balls more frequently because the balls will be less spaced out. The converse is true if the thrower is moving away from the man. So it is actually the wavelength which is affected; as a consequence, the perceived frequency is also affected. The first attempt to extend Doppler's analysis to light waves was soon made by Fizeau. In fact, light waves do not require a medium to propagate and the correct understanding of the Doppler effect for light requires the use of the Special Theory of Relativity. where vs is the velocity of the object (source of waves) with respect to the medium, and is the angle between the object's forward velocity and the line of sight from the object to the observer. 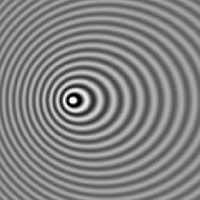 The Doppler effect for electromagnetic waves such as light, is of great use in astronomy, and results in either a redshift or blueshift. It has been used to measure the speed at which stars and galaxies are approaching toward or receding from Earth, that is, the radial velocity. This is used to detect if a single star is, in fact, a close binary (i.e. double star) and even to measure the speed of rotation of stars and galaxies. 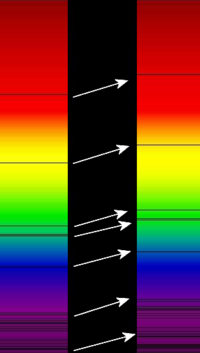 Another use of the Doppler effect which is found mostly in astronomy is the estimation of the temperature of a gas which is emitting a spectral line (a dark or bright line in a spectrum, whether visible light or otherwise). Due to the thermal motion of the gas, each emitter can be slightly red or blue shifted, and the net effect is a broadening of the line. This line shape is called a Doppler profile and the width of the line is proportional to the square root of the temperature of the gas, allowing the Doppler-broadened line to be used to measure the temperature of the emitting gas. 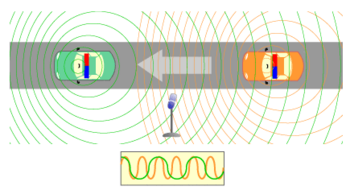 The Doppler effect is also used in some forms of radar to measure the velocity of detected objects. A radar beam is fired at a moving target, such as a car, moving away from the radar source (a police car, for example). Each successive wave has to travel further to reach the car, before being reflected and re-detected near the source. As each wave has to move further, the gap between each wave increases, increasing the wavelength. In some situations, the radar beam is fired at the moving car as it approaches, in which case each successive wave travels a lesser distance, decreasing the wavelength. In either situation, calculations from the Doppler effect accurately determine the car's velocity. The Proximity fuze which was developed during World War II also relies on the Doppler effect. Instruments such as the laser Doppler velocimeter (LDV), and Acoustic Doppler Velocimeter (ADV) have been developed to measure velocities in a fluid flow. The LDV and ADV emit a light or acoustic beam, and measure the Doppler shift in wavelengths of reflections from particles moving with the flow. This technique allows non-intrusive flow measurements, at high precision and high frequency. ↑ Reprinted in: Kurt Bretterbauer et al., Christian Doppler, Leben und Werk. Der Dopplereffekt, Salzburg 1988. ↑ D. H. Evans and W. N. McDicken, Doppler Ultrasound (Second Edition, John Wiley and Sons, 2000). Adrian, Eleni & David Curtis. 1995. The Doppler Effect. University of Illinois. Retrieved January 1, 2007.